One of the biggest announcements to come out of Google Marketing Next, held in San Francisco last week, was the release of Google Attribution. The new, free solution can pull in data from Google Analytics, AdWords or DoubleClick Search to provide a more holistic view of conversion actions across channels and devices for attribution modeling and bidding information. Here’s a look at what this new solution means for search marketers. Google Attribution is the simplified version of Attribution 360, the enterprise-level offering that came out of Google’s 2014 acquisition of multichannel attribution solution Adometry. It integrates with Google Analytics, Google AdWords and DoubleClick Search and doesn’t require any additional site tagging. Marketers link a Google Analytics view that’s already associated with a Google AdWords or DoubleClick Search account. Once the account is set up, Attribution is populated with the channel performance data from the connected Analytics view. Marketers can then assign an attribution model to their conversion events. And as in Analytics, it’s possible to compare models side by side. With the native integrations, the modeled conversion data can feed back into AdWords or DoubleClick Search to inform bidding decisions. What problems does Google Attribution aim to solve? 1. How to see and credit upper- and mid-funnel interactions: Bill Kee, group product manager at Google​, who introduced Attribution onstage last week, said in a phone interview that Google Attribution is focused on understanding the full customer journey versus only last-click impact. The limitation with last-click is that gives all the credit to the user’s very last touch point before converting. For example, if a user searches and clicks on an ad on a non-brand search term, then converts later from a brand ad click, only the brand ad will get credit in a last-click attribution model. And if a marketer can’t see that a generic keyword actually got the ball rolling, she might lower the bid or pause the keyword altogether. There are obvious benefits for Google in showing advertisers that more of their search and display ads played a role in the conversion path, which brings us to second problem Attribution aims to solve. 2. How to easily inform bidding decisions based on full-funnel attribution data: By automatically sending modeled conversion data into AdWords, advertisers can see the conversion impact of keywords and ads based on multichannel and multidevice conversion path data. Automated bidding can take upper- and mid-funnel contributions into consideration. Again, this obviously has a benefit to Google as well. How is this different from attribution already in AdWords? Google has been taking steps over the past several years to take AdWords from an exclusively last-click platform to one that is more flexible. Google completed the migration from Converted Clicks to Conversions last September, in large part because Conversions supports attribution modeling other than last click. Google started showing click and conversion assist data from Analytics before that, but there was no way to set a conversion action to a model other than last-click for conversion reporting and bidding until last year. The attribution tool introduced in AdWords in 2014 is for search funnels only, which means it only reports on whether users interact with multiple ads from an advertiser. It doesn’t provide any insight into the interplay of ads with marketing efforts on other channels, unless advertisers are using data-driven attribution (more on that below). Google Attribution provides the cross-channel context that is missing in AdWords attribution. How is this different from what’s available in Analytics? Through the existing integration with Google Analytics, AdWords advertisers have been able to see paid search and Display Network data in Analytics’ multichannel funnel reporting and in the attribution model comparison tool in Analytics. Attribution offers more depth than Analytics, however. All of the attribution models in Google Attribution include more touch points than they do in Google Analytics. It also includes Google’s data-driven attribution. What is the data-driven attribution model? Attribution is by nature an imperfect science. Capturing all the touch points involved in a conversion event in one system, then assigning credit to one, some or all of those steps in a way that accurately reflects the impact on a consumer’s purchase decision is what Google is trying to get closer to with data-driven attribution. Google’s own data-driven attribution model uses machine learning to understand how marketing touch points increase the likelihood of conversion given a particular sequence of exposures. Based on the custom probability modeling, the data-driven model assigns fractional conversion credit to each touch point. 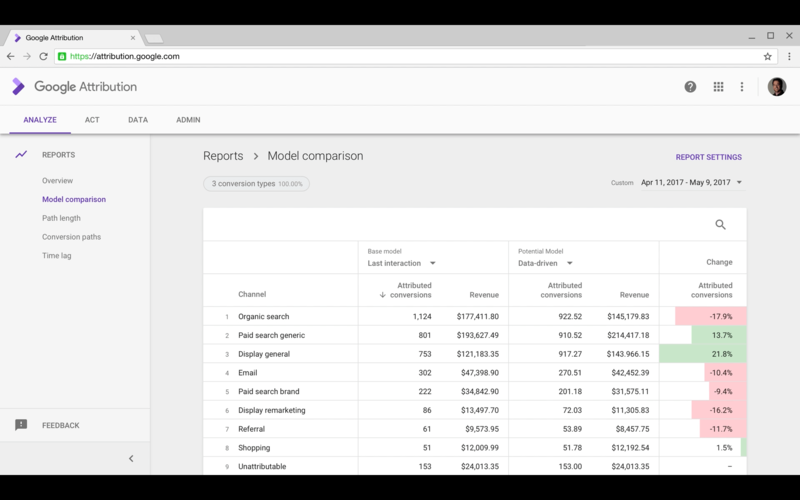 Google first introduced data-driven attribution modeling in 2013. It’s been available in Google Analytics 360 and Google Attribution 360, and Google brought the model into AdWords last year. Requirements: Because it doesn’t simply assign credit to an channel based on where it occurred on a conversion path, data-driven attribution needs sufficient data for the modeling to work. The modeling is done at the conversion action level. A conversion action must have at least 15,000 clicks and at least 600 conversions within 30 days to be eligible for data-driven modeling. The model then captures 30 consecutive days of data before reporting. (In a sign of advancement, when it first became available in AdWords, the data-driven model requirements were 20,000 clicks and at least 800 conversions.) If none of your conversion actions meet the criteria, it might make sense to set up a micro-conversion event that still has some business meaning and can be used to evaluate this model against the others. Data-driven attribution in Google Analytics 360 only includes the last four touch points, whereas, in Google Attribution & Attribution 360, the model includes all touch points, whether a user visits the website or not. That means it also factors in ad impressions. Google says that where measurable, viewability can also be counted for display impressions. In the screen shot example above, last-click/interaction attribution is compared against the data-driven model. My experience with using data-driven attribution in Adwords reflects the paid search results above, though less dramatically. Brand campaigns convert somewhat lower and non-brand campaigns convert somewhat higher when compared to last-click, which intuitively makes sense. Google is encouraging adoption of data-driven attribution, but advertisers can still use the other models in Attribution. It’s possible to monitor and evaluate how the various models perform for each conversion action within Attribution before opting to push new models into AdWords. Once pushed, the models will override whatever models were set in AdWords, and conversion columns will reflect the new modeling. Automated bidding strategies will then use that data in decisioning. Google Attribution is now in beta and will roll out to more advertisers over the coming months. 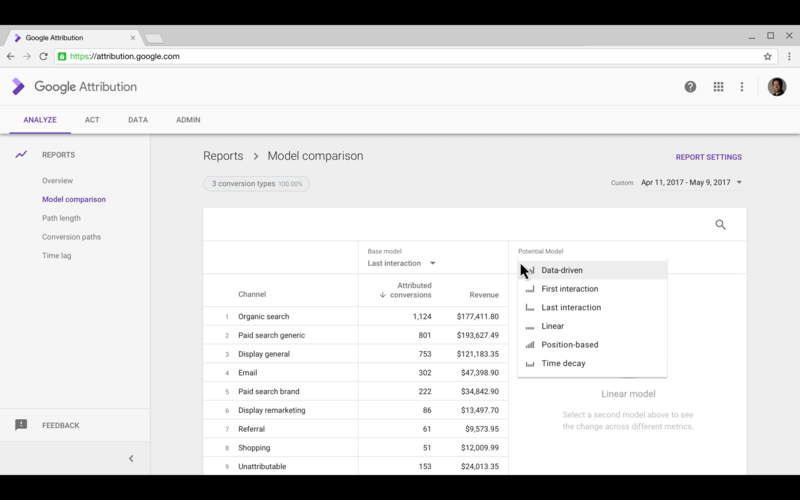 In the meantime, advertisers can look at data-driven attribution modeling in AdWords if available. The post Google Attribution: What search marketers need to know appeared first on Search Engine Land.